One of the best thing you can teach your child if they become lost in the woods or wilderness is to stay put. 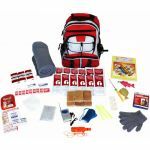 Rescue workers are more likely to find someone that has not wandered off too far from when they were last seen. As soon as they realize they do not know where to find camp or have been separated from you, they should stop and wait where they are. 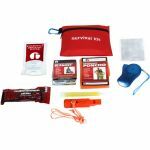 Their survival kit will have things to keep them dry and warm and by sitting in one place, rescue will come much sooner. They should actively work to get rescued by blowing on their whistle every so often, setting out anything bright that can be seen from a distance, and using their light sticks or flashlight at night to let search and rescue teams find them quickly. 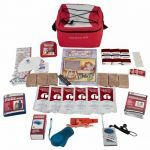 These children's survival kits provide the items they need to make through the night, help themselves to get rescued, and give a little comfort to their scared minds.